Baby scales and toddler scales are suitable for maternity, neonatal and at home for keeping a check on the baby's weight. Manufactured by Adam Equipment, the baby scales we offer feature a safe and secure weighing pan that features a smooth design, placing the comfort of the child as a priority. The MTB weighing scale features a detachable weighing pan that also allows for the weighing of toddlers. Scaletec offers a variety of professional medical scales for accurately monitoring the weight of newborn babies, children and adults. If you require more information about our range of baby and infant scales, please contact us. 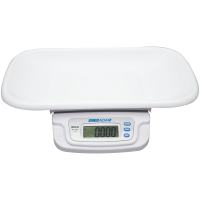 The MTB baby scale from Adam Equipment is a versatile baby / toddler weighing scale offering an easy to read LCD display with a hold feature to capture a baby's weight. Perfect for neo-natal wards, paediatricians, doctors offices and personal home use. Q: Why do babies need to be weighed? It is essential to record a regular weight of new-born babies to ensure that they are developing and growing at an expected rate. Weight is used as a primary indication for health problems and can detect if a new-born is underweight or overweight based on a regulated development plan or grow charts. It is recommended that parents have babies checked regularly, however this will largely depend on the stage of the baby's development. As a general guide: Check-ups are recommended once a month for babies up to the age of 6 months, every few months between 6-12 months and every 3-4 months for children over 12 months old. New parent, baby and toddler forums can also provide crucial information about caring for your baby, nutritional guides and general help.